Akshay Kumar's many collaborations with first-time directors have earned him more hits than misses over the years. Akshay Kumar, whose new film Entertainment is going strong at the box office, has transformed into a maverick of sorts when it comes to recognising new talent. While writer duo Sajid-Farhad made their directorial debut with Entertainment, Kumar's next film, Gabbar, scheduled for release early next year, has been helmed by another newcomer named Radha Krishna Jagarlamudi (Krish). Akshay Kumar revisited his Khiladi moniker with this 2012 hit. The film was met with mixed reviews but was a huge hit with the audience. Akshay Kumar has given three successes in a row with Sajid Khan. Their journey started with Heyy Babyy, which was Sajid's feature length directorial debut (he had first directed a part of Darna Zaroori Hai). The film was a hit and the actor-director jodi went on to deliver successful comedies like Housefull and Housefull 2. Sabbir Khan-directed Kambakkth Ishq was Akshay Kumar's biggest opening film ever with a debutant. A stylishly packaged film with snazzy promos and chart topping music, Kambakkth Ishq was also one of the most expensive films ever made by producer Sajid Nadiadwala. The film was panned by critics but managed to stretch to the 50-crore mark, courtesy its very good opening. Desi Boyz did impressive business considering it was director Rohit Dhawan's first film. Dhawan and Akshay had been toying with a few story ideas, out of which, this adult comedy made its way to the screens. Touted as the most expensive film ever on its release, Blue was a highly anticipated film. First time director Anthony D'Souza showed that he had flair for technique and brought in some of the best action sequences ever seen in a Bollywood flick. The film saw a huge opening at the box office but rounded off its box office stint as an average fare. If not for the disagreement between Yash Raj Films and multiplexes, Tashan would have done better than it did at the box office. Though the film wasn't any great shakes, Akshay was clearly the best thing about this multistarrer. Moreover, debutant director Vijay Krishna Acharya showcased his keen eye for style, and went on to direct last year's blockbuster action film Dhoom 3. When Jaan-e-Mann was announced, it created a lot of buzz since it starred Akshay Kumar and Salman Khan as leads. With Sajid Nadiadwala sparing no expenses, debutant director Shirish Kunder got a huge canvas to incorporate an experimental narrative in this love triangle. The film unfortunately flopped due to its face-off with Shah Rukh Khan starrer Don. A close friend of Akshay's, director-producer Vipul Shah has been collaborating with the actor for over a decade now. It all started with Aankhen, a heist thriller. The film was a hit and the duo went on to work together on Waqt, Namastey London, Singh Is Kinng, Action Replayy and Holiday. Khiladi 420 came at the time when Akshay was looking at extending his winning streak with the Khiladi franchise. The film had wonderful promos and a terrific first half. However, the second half proved to be a spoiler, hence resulting in the film's downfall. Akshay's dare devil stunts are still remembered though. If Akshay worked with a first time director in Yash Raj's Tashan, he had agreed to do the same with the production house's Yeh Dillagi too before that. 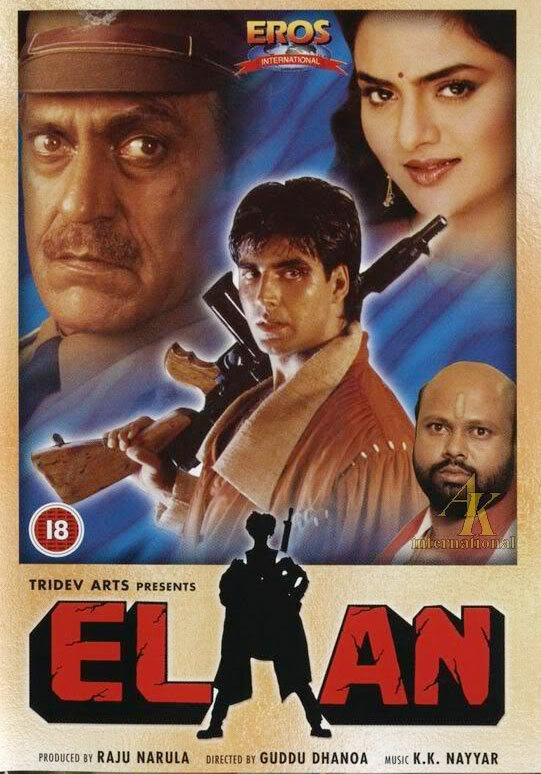 Akshay won hearts with his restrained act in the film. At a time when action films promised good returns at the box office, debutant director Guddu Dhanoa-helmed Elaan came out. This Akshay starrer actioner was a box office success too. Akshay Kumar's HOTTEST heroine? VOTE! The CUTEST dogs in the movies!